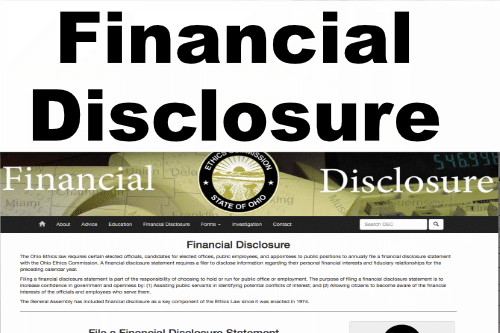 The Ohio Ethics law requires certain elected officials, candidates for elected offices, public employees, and appointees to public positions to annually file a financial disclosure statement with the Ohio Ethics Commission. A financial disclosure statement requires a filer to disclose information regarding their personal financial interests and fiduciary relationships for the preceding calendar year. Filing a financial disclosure statement is part of the responsibility of choosing to hold or run for public office or employment. The purpose of filing a financial disclosure statement is to increase confidence in government and openness by: (1) Assisting public servants in identifying potential conflicts of interest; and (2) Allowing citizens to become aware of the financial interests of the officials and employees who serve them. The General Assembly has included financial disclosure as a key component of the Ethics Law since it was enacted in 1974.